Now that our Florida weather has cooled off a little I'm really finding that I'm in to the fall colors. I've also begun thinking of gifts I need to the next 4-6 weeks. 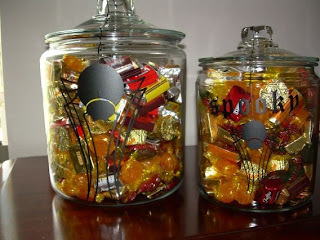 The picture of the 2 filled candy jars are for 2 different groups. The Spooky spider is from the Stampin'Up Decor Elements Decorative vinyl line. The smaller of the jars features the small size Spooky Spider #114761. The larger jar is using the medium size spider #114762. On the larger jar I put the spider on one side and the words Spooky on the other. There is also a large size for purchase #114763. The prices are 5.95/10.95 and 14.95 and they are available in black or white. The jars I'm using came from Walmart and Target. I hope you enjoy this quick gift or home decorating idea.